CSC Services are a Sika Liquid Plastics Quality Approved Contractor. These products can be used on flat and pitched roofs across a range of industries, including water towers, reservoir roofs, power station roofs, hospitals and schools. The Decothane Ultra family of products are high performance, polyurethane coatings which rapidly become resistant to rain damage. Decothane Ultra has been pioneered for use in sensitive areas such as hospitals, schools and food manufacturing plants as it achieves a scientifically proven lower odour. A full survey will be carried out and condition report produced. Any areas of water ingress or damage can be assessed. Continuity of insulation assessed and work categorised into order of urgency. Costs can be broken down to show different roofs. Upon request thermographic surveys can be completed to quantify savings in energy usage made by installing the new roofing system. Work can be scheduled for weekends and evenings if necessary and is undertaken with speed, precision and minimum noise. Once completed Sika will provide a 10 – 25 years guarantee (depending on products used). This single point guarantee will cover the entire roofing system giving full peace of mind for years to come. Decothane Ultra can be installed over existing roof coverings minimising costs and upheaval associated with stripping roofs. Very fast application allowing for speedy installation. Use of patented technology developed specifically for use in highly sensitive areas. Much lower odour when benchmarked against other single pack polyurethanes. Decothane Ultra is cold applied. It requires no heat or naked flame during application, a must where safety is paramount. Decothane Ultra becomes rapidly rain resistant meaning the roofing is free from rain damage immediately after application. Liquid applied allowing for a seamless and attractive finish. These are seamless, cold applied, liquid roofing systems for the waterproofing of flat roofs, balconies, associated walls and more. CSC Services have been fully audited and meet stringent standards in the application of these products. Sika Liquid Plastics will guarantee products when installed by a QA Approved Contractor such as CSC Services offering full peace of mind to the client. One contractor, one manufacturer, one solution! You can read CSC Services’ Short Guide to Liquid Roofing here. For more information on Sika Liquid Plastics products please click here. 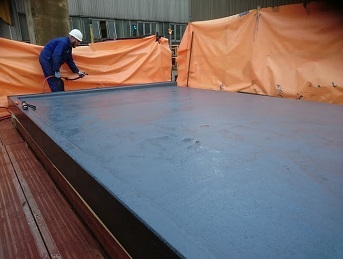 CSC Services provide refurbishment services and protective coatings to structures across the UK water sector, in nuclear power stations, public sector buildings such as schools, hospitals and prison buildings, and across UK infrastructure including bridges, tunnels, culverts and sewers. Call us on 0191 410 3444 today for help or advice. Sika’s flagship liquid roofing membrane was installed to a Pumphouse Roof at Hartlepool Station in October 2016 for client EDF Energy. With a 15 year guarantee the Decothane Ultra System will outlast the life expectancy of the station. The cold applied system offered a safe, speedy and cost effective repair solution to a failed felt roof. Defective felt and stone chippings along with fascia boards and guttering were removed. Sika’s Decothane Ultra was specified for the work due to its very fast application allowing for speedy installation which minimised disruption to service. I was very impressed with the quality of the installation and the trained Sika Liquid Plastics installers achieved an aesthetically pleasing finish. It was also nice to see the CSC Services’ operatives checking data sheets and specifications throughout the project to ensure they were working within Sika recommendations and guidelines. I look forward to inspecting future work undertaken by CSC Services. (Will Russell, Sika Field Technician).